Connectivity has grown in importance across the evolving mobility landscape, driven by V2X infrastructure development, which will support / enhance the proliferating set of mobility models and the evolution of connected ecosystems. 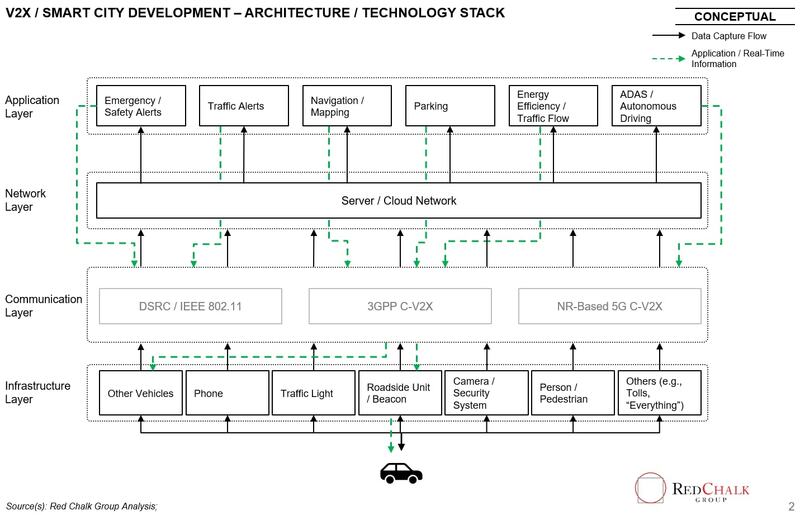 The Automotive / Mobility landscape is undergoing significant transformation driven by connectivity – V2X infrastructure is a critical piece of this evolution which will unlock new capabilities such as safety alerts, enhanced traffic management, and next-gen capabilities (e.g., autonomous). These connectivity-enabled services will support a proliferating, future set of mobility models and continued evolution in connected ecosystems (e.g., connected car), which requires communication standards to ensure data interoperability and security to maximize the benefits of V2X infrastructure. 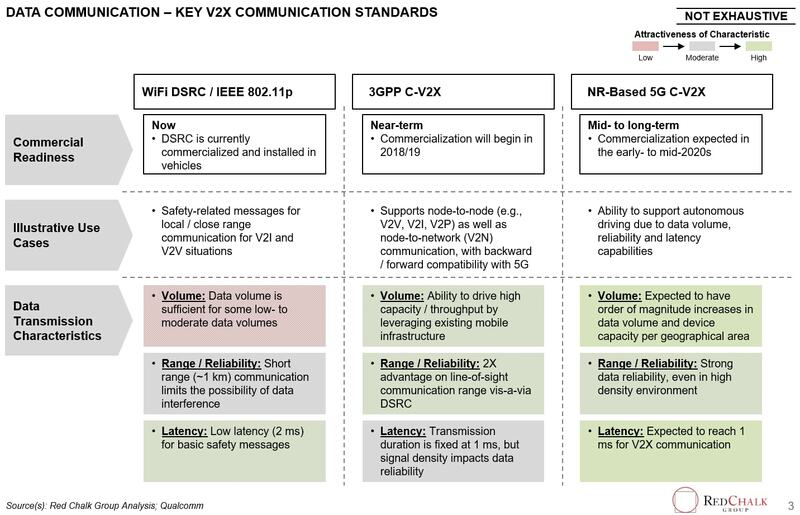 WiFi DSRC, cellular C-V2X, and 5G C-V2X standards have risen as the primary candidates for V2X data communication, and key industry stakeholders have taken varying views on the optimal solution – the eventual winning solution is poised to drive transformational impact across the ecosystem. Below we describe the context and environment surrounding the development of V2X infrastructure and the key characteristics / stakeholders for these communication standards. 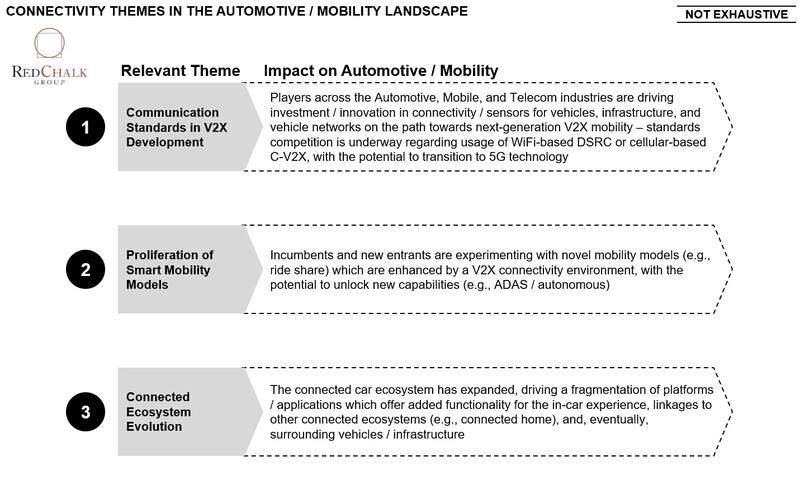 Connectivity has grown in importance across the evolving automotive / mobility landscape, with incumbents and new entrants investing in V2X technology / infrastructure, new business models, and connected ecosystems. V2X infrastructure is comprised of vehicles, pedestrians, and various pieces of infrastructure connected to each other and the broader network through communication standards, which may be variegated based on the needs of the network / application. 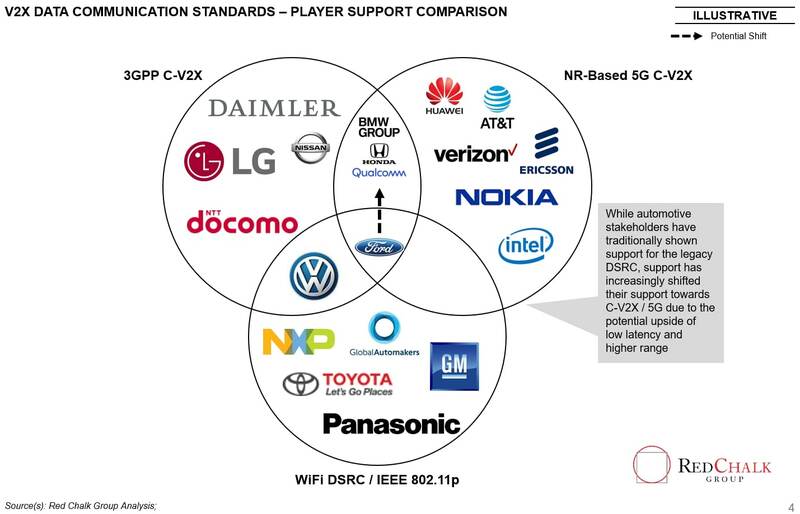 …with each standard holding a different set of primary proponents – Auto OEMs have historically pushed for legacy DSRC, but key auto makers (e.g., Ford) have begun shifting their interest towards C-V2X due to its compatibility evolution to 5G. 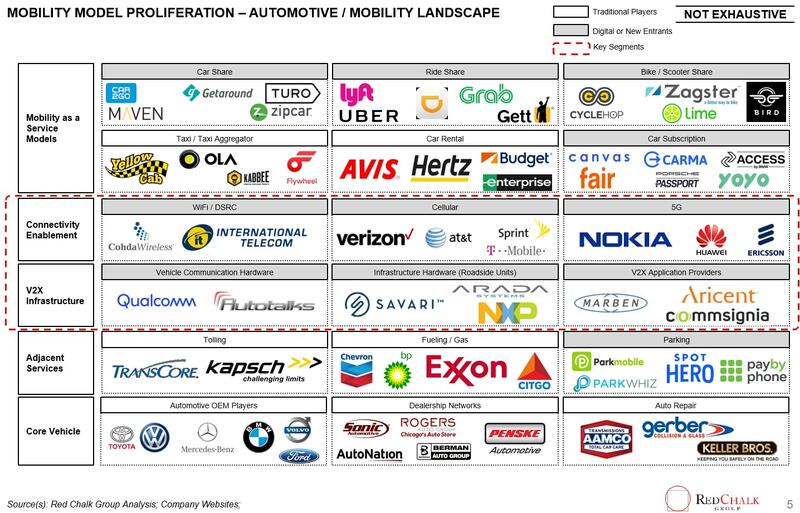 As the mobility landscape evolves, connectivity and V2X will act as a central driver in enhancement of mobility through increased safety (e.g., alerts), value-added services (e.g., HD mapping) and advanced driving capabilities (e.g., ADAS / autonomous). 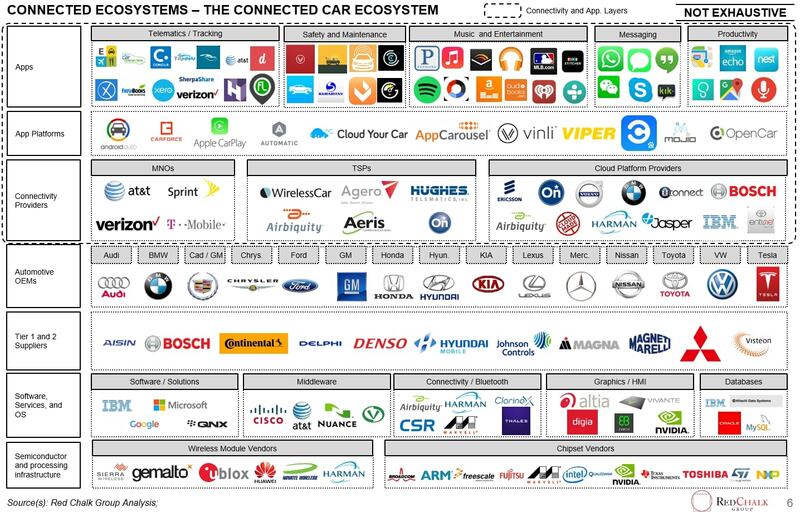 The connected car ecosystem has undergone fragmentation across application platforms and a proliferation of apps / functionality as the market has matured, heightening the need for secure connectivity in-vehicle. 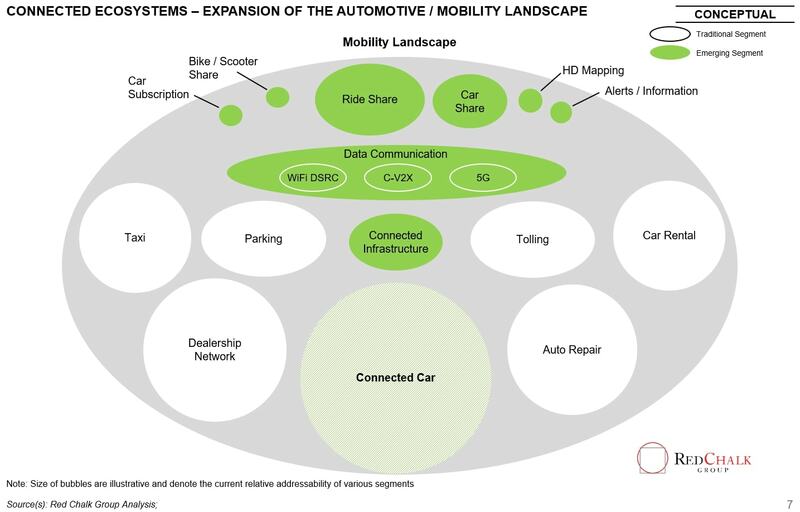 As the mobility landscape evolves, connectivity underpins the enhancement of current models and unlocks potential for more advanced capabilities (e.g., HD mapping, Autonomous) – data standards are an essential stage gate in this process. Explore how Red Chalk Group can help your company define a strategy to take advantage of the upcoming digital evolution across the mobility landscape.